I grew up feeling rejected by my grandmother and father because I was a girl. My mom urged me to study hard to get ahead. I grew up wishing I was a boy and learned to be self-reliant and competitive. Becoming a software engineering manager in my twenties could have made Mom very proud of me. However, she passed away at age 48 before I had a chance to buy her a big house or take her traveling around the world. Something was missing in me until I met Jesus Christ in 1989. When I felt loved and accepted by my Heavenly Father, I was on the road to recovery holding onto the truth that, "So God created man in His own image; in the image of God He created him; male and female He created them" (Genesis 1:27). Helping other women like me is my calling! One of my favorite ministries is speaking at women retreats (here is one of those events). I also hang out a lot with other women - one of the groups I belong to is called Fullness in Christ Fellowship (FICF) and it consists of women in ministries. I first joined them in 1998 after becoming a children's minister upon graduation from seminary and I have been attending their monthly or quarterly gatherings, annual retreats, and sharing my writing on their website. 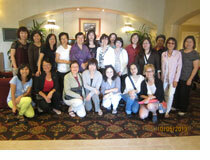 This year, instead of a sisters' retreat, FICF has organized a national conference in November 1-3, 2013 in San Francisco Bay Area for men and women, OBC and ABC, speaking Mandarin, Cantonese, and English. I will be speaking on parenting with emphasis on gender issues. Although the conference is not free, I am offering to sponsor one of you to attend the conference. If you want to attend at no cost to you, please e-mail me to enter your name into a drawing. I will randomly draw one name at 9 a.m. on Monday, October 14 and notify the winner. In any case, you still have time to get a big discount if you register before October 15. Please check out the Chinese track and/or the English track via these links.